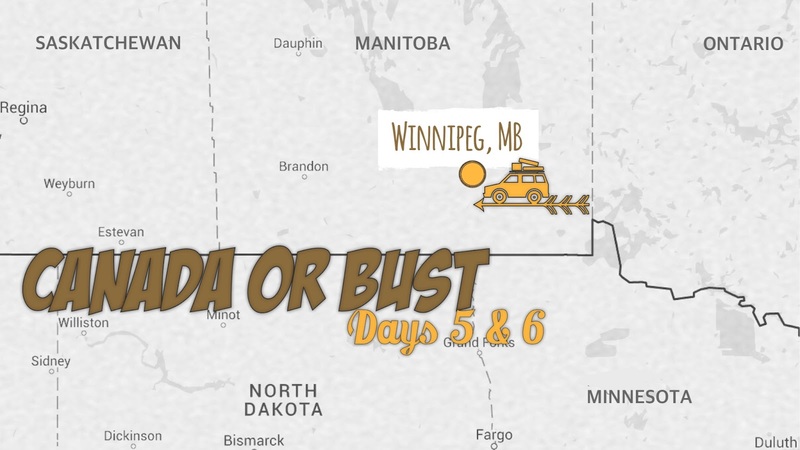 Days 5 & 6: Winnipeg, MB. 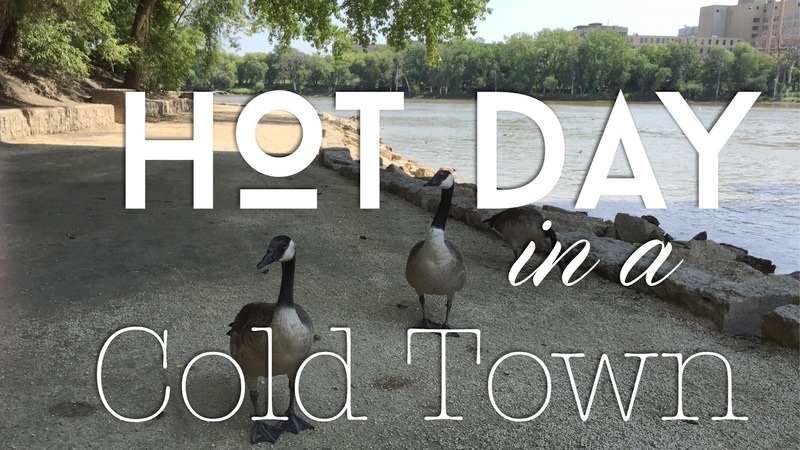 To avoid the kind of fatigue which often besets us on lengthy road trips, we are trying to build in some "off" days, and Wednesday was one of them. On Thursday, we hit the ground running. By the time we left our hotel at 9:00, the temperature was already an unseasonably warm 76°, with a high of 90 promised. 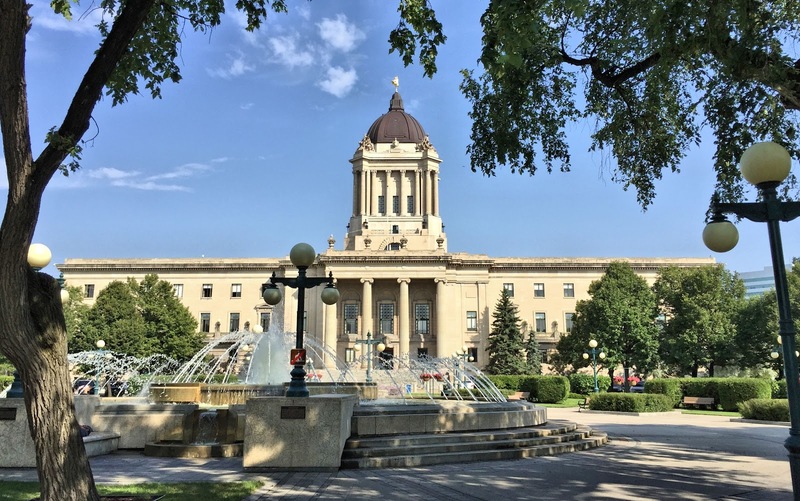 For a city nicknamed "Winterpeg" because of its infamously long, cold, snowy winters, this was twenty degrees above average for this time of year. Our first stop was the Manitoba Legislative Building—equivalent to a state capitol in the U.S. Though summer is their busy season for tours, parking was free and readily available when we arrived around 9:15. We found a shady spot about ten yards from the building entrance. Just inside the doors, two uniformed guards at a security desk greeted us, logged us into the visitor register and gave us badges to wear. No security screening equipment was in sight. 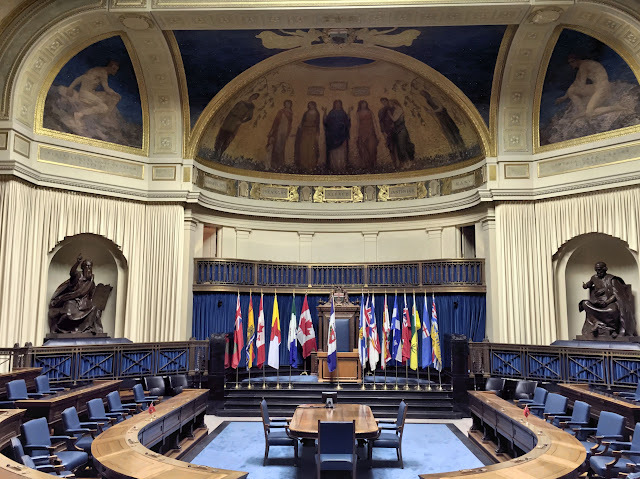 We missed the beginning of the 9:00 tour but caught up with them as they entered the chamber of the province's unicameral legislative assembly. 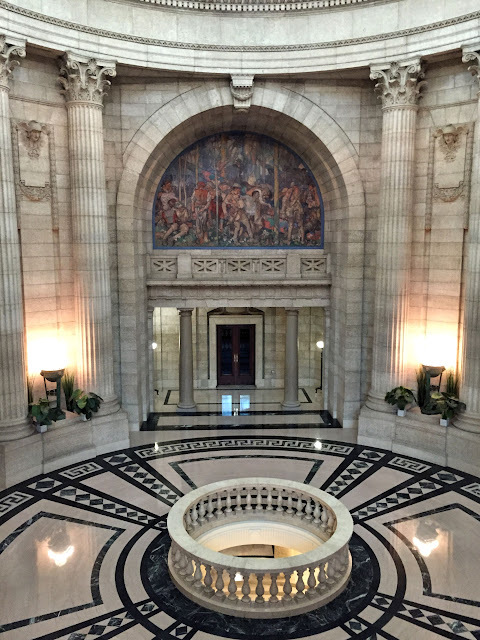 The elegant chamber is decorated with various allegorical murals representing ideals of justice and the law. Of note, it is the only room in the building that is air conditioned. After selecting a design from an architectural competition, the Manitoba government began construction of its legislative building in 1913. World War I expenses and shortages delayed its completion until 1920. 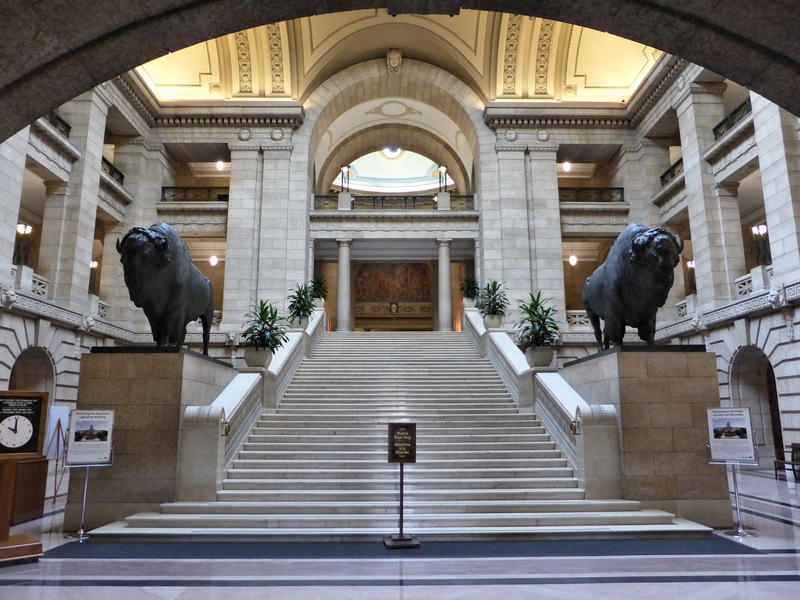 Both the exterior and most of the interior walls were built of Tyndall limestone, quarried just 30 miles from Winnipeg. Though it may make the building more difficult to heat in winter, the stone also helps keep it cooler in summer. 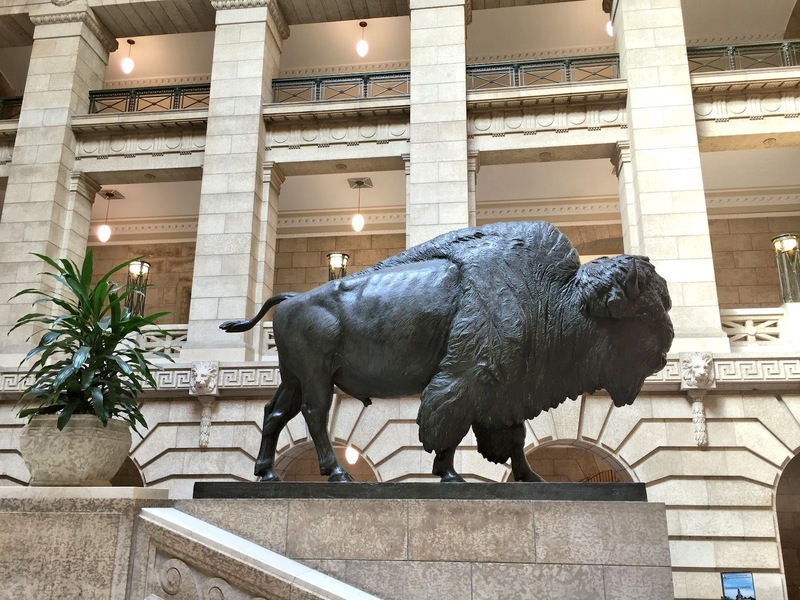 Perhaps the most legendary feature of Manitoba's legislative building is a pair of bronze life-size bisons flanking the base of the grand staircase. Designed by a French sculptor, the massive figures were cast in New York due to material shortages in Europe, which delayed their delivery. According to local lore, huge slabs of ice were cut from the nearby Assinboine River to slide the 5,000-lb. bisons safely over the already completed marble floors for installation. Our visit to the legislative building was cut a bit short by an 11:00 appointment for a tour of the Royal Canadian Mint, which produces all of Canada's circulation coins and manufactures coins for 76 other nations. Though the mint is government owned, its services to other countries make it a profit center, needing no taxpayer support for operating costs. 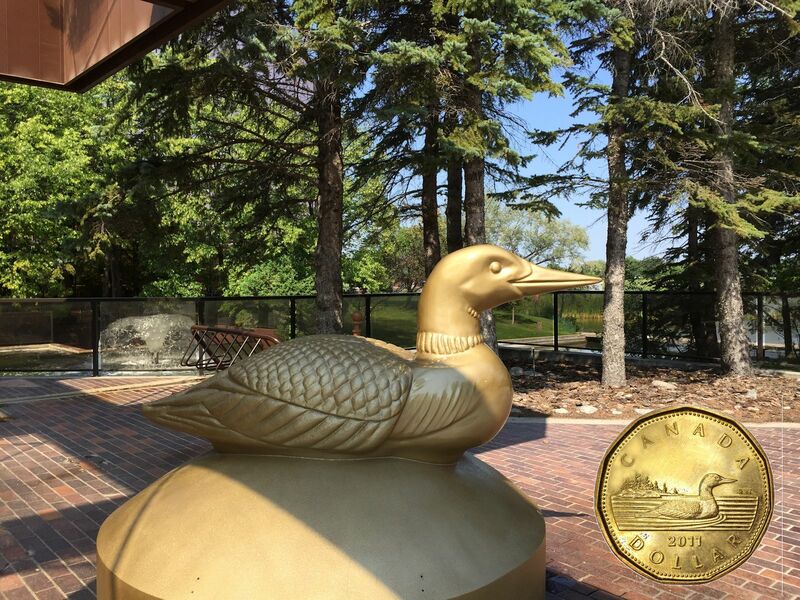 The Canadian Mint has established a history of innovation, patenting technologies that have increased the security of coins while reducing the cost of producing them. Canada was the first country to issue circulation coins with color, a service subsequently provided for some of its foreign customers. Recently introduced, a new quarter uses color to commemorate the 50th anniversary of the Canadian flag. At its Ottawa plant, the mint also turns out many types of collector coins and medals using precious metals. 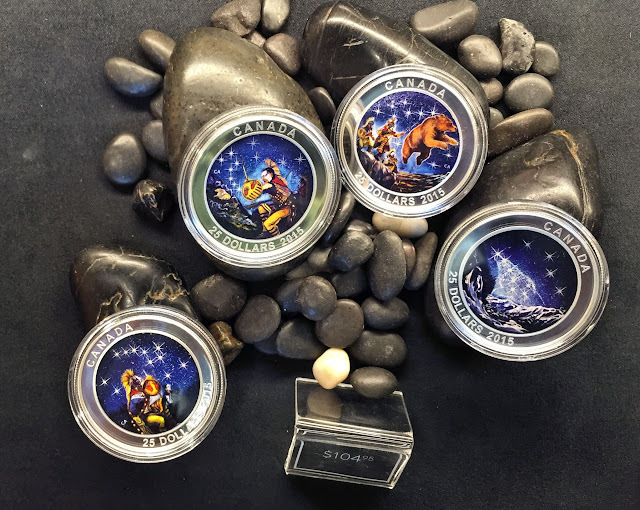 Special technologies developed in house allow for the use of holograms, enameling, and even embedded crystals to enhance these special products for both Canada and the mint's international clientele. Outside the mint, a sculpture commemorates the loon that gave the one dollar coin its nickname, the loonie. 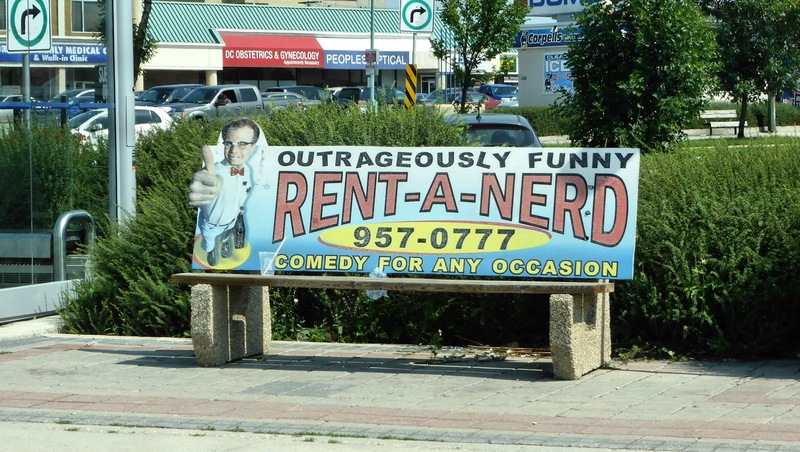 Unlike the United States, Canada has taken a practical approach to its currency. In the 1980s, Canada replaced one-dollar and two-dollar notes (with a 2-to-4 year life span) with coins, which can last up to 30 years. 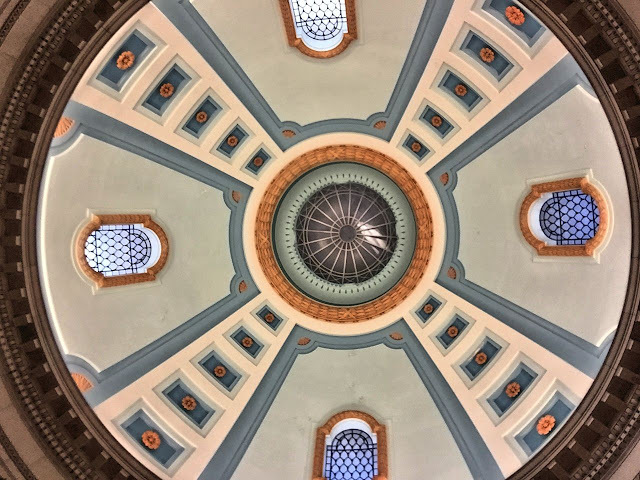 America's nonpartisan Government Accountability Office (GAO) has been recommending a similar change in the U.S. since 1990, estimating a government saving of as much as a half a billion dollars a year. 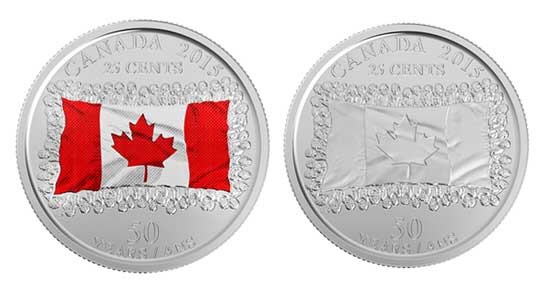 In a similar vein, when Canada realized their penny was costing almost two cents to produce each coin, manufacture of the coin was ceased in 2012. On behalf of the government, banks accepted exchange of the coins for a year, and its use was phased out. 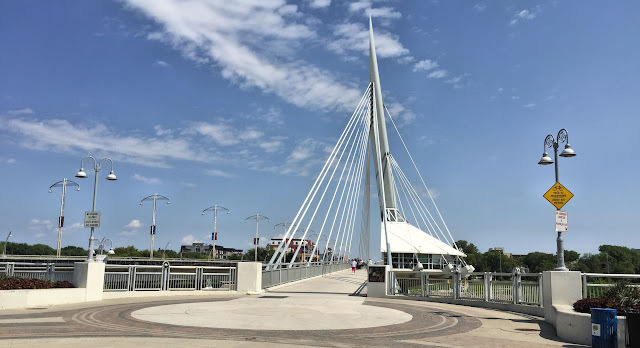 From the mint, we drove to The Forks, a popular public space in downtown Winnipeg located at the confluence of the Assinboine and Red Rivers. We found lunch from food vendors in the Forks Market, housed in former horse stables. Inside the market we saw a couple of musicians entertaining customers as they shopped and ate. 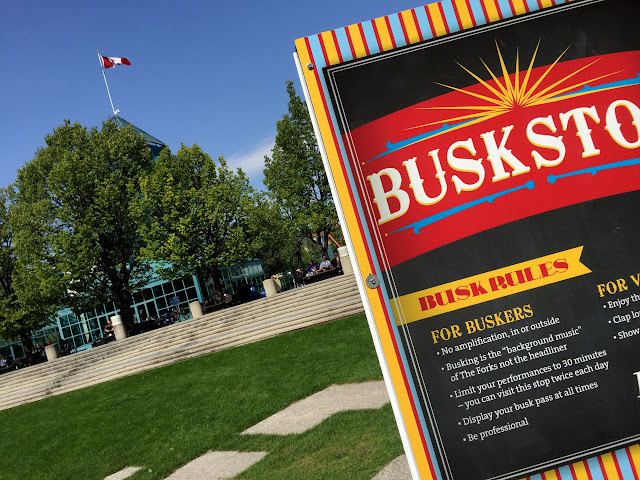 With the outside temperature above 90° F., a rare event in this northerly city, no performers were using the "busk stops" in the Forks area today. 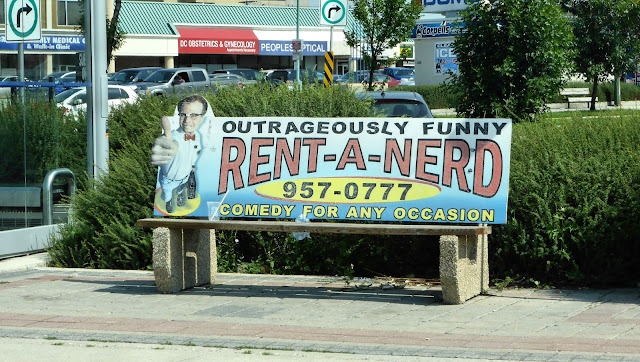 These mini-amphitheaters allow buskers (street performers) to collect an audience—and, with a bit of talent and luck—some of those coins the mint is producing. 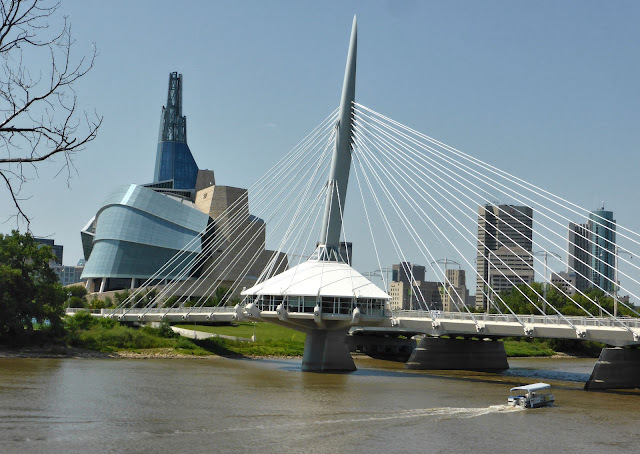 A number of museums, historic monuments, and other outdoor facilities are all part of The Forks. Since 2004, one of the most visible symbols of the area has been Esplanade Riel, a cable-stayed pedestrian bridge spanning the Red River and connecting downtown Winnipeg with St. Boniface, the old French Quarter of the city, home of Saint Boniface Cathedral. 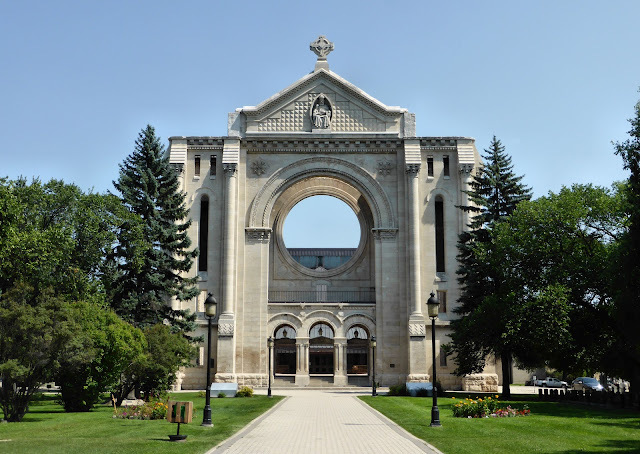 After a 1968 fire destroyed most of the 1906 cathedral, the old facade was left as a historical tribute with a new sanctuary built behind it. Our sightseeing done after visiting the cathedral, we joyfully returned to the air-conditioned confines of our hotel and got some laundry done. 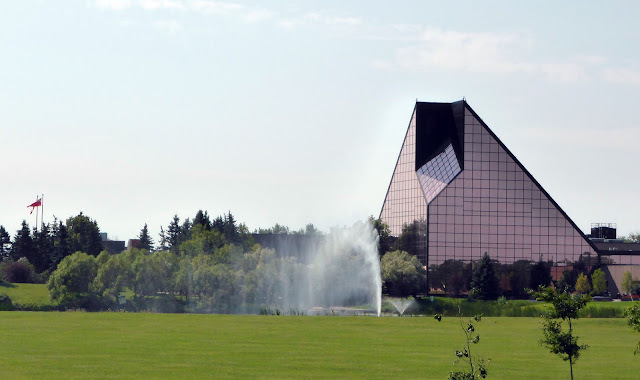 After dinner at the nearby Hilton's Bistro 1800, we packed up our clean clothes in preparation for departing Winnipeg—and Manitoba—tomorrow. We'll be driving west into Saskatchewan and its provincial capital of Regina (ruh-JY-nuh, rhymes with "the china"). 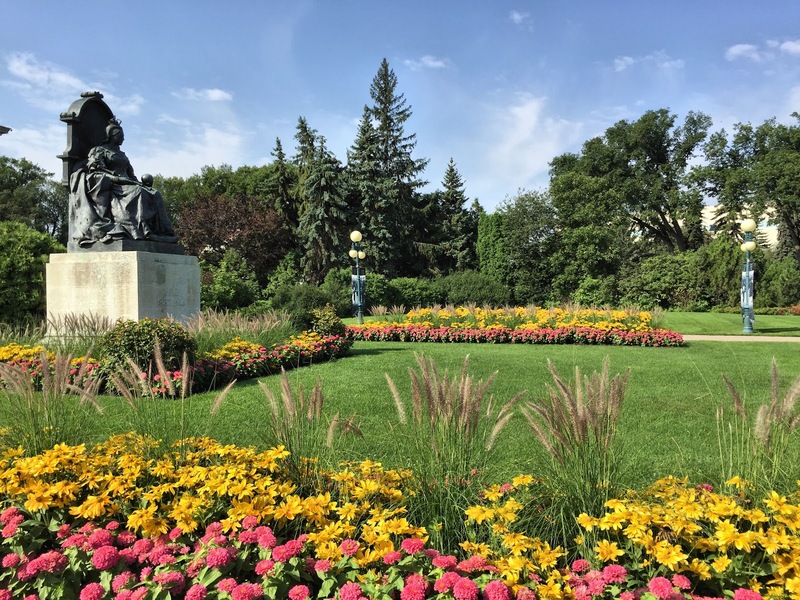 On the British throne when Manitoba became a province, Queen Victoria now rules over the legislative flower gardens. At the Mint, we were allowed to pick up this (heavy!) 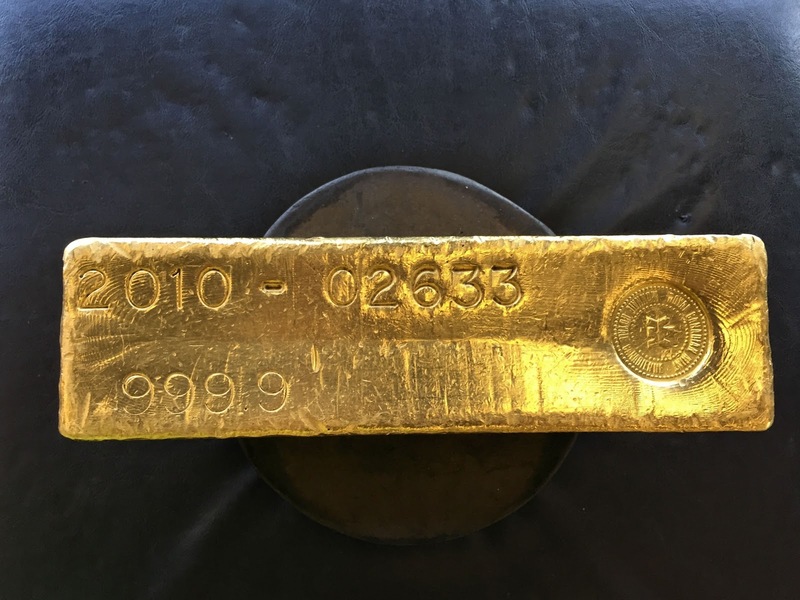 99.99% pure gold bar worth more than a half million dollars.